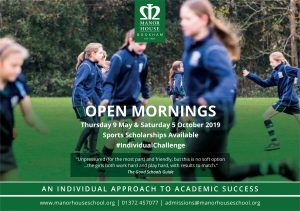 All Manor House School teachers are excellent at providing individual additional help within the classroom and differentiating for the needs of girls but it is recognised that, for some, a little more is required. For these girls we are able to provide one-to-one support from highly qualified specialist teachers. Academic Advancement is tailored to the needs of the individual, using multi-sensory learning, and aims to develop strategies and methods that can be used by a pupil to underpin independent learning across the curriculum. It aims to develop independent learning skills in all girls and to equip them with the ability to deal with their learning needs in all situations. The Academic Advancement Department works closely with all staff to help girls to achieve their potential. It is recognised that a pupil may require some additional help with her learning at any point in her Manor House education. Equally, she may speak English as an Additional Language or have an ECHP. Manor House School provides academic support to girls through a graduated approach. Initially, girls are supported through a multitude of ways within the class itself. For example, this will include differentiated work, resources and learning aids. If a girl continues to make insufficient progress, their provision will move to the next tier of support – targeted group support directed by the classroom teacher. Outcomes will be set for the pupil to achieve within a specified period and this will be tracked and evaluated on the class/department provision map. If there continues to be difficulty, the teacher will refer to the Head of Academic Advancement and discuss the best way forward in consultation with parents. The girl concerned will usually be assessed and, if appropriate, lessons will be arranged and teaching staff kept informed of the girl’s learning. The vast majority of girls receiving additional help have one 30 minute session each week which carries an additional charge (please see School Fees for details). Help is offered according to the needs of the individual; some girls may only need short-term help to give them the tools they need to move on independently, others will require longer-term assistance and continue with lessons until such time as their specialist teacher feels that they are able to work effectively across the curriculum without them. We aim to offer as much flexibility as possible; for example a girl may discontinue their lessons, but come back for further assistance later on in their school career. All our girls are offered the opportunity to ‘drop in’ and discuss any learning issues if and when they feel they need to – our aim is to support the individual as far as is possible, but to balance this at all times by fostering independence and self-confidence. The Academic Advancement Department carries out assessments for access arrangements for public examinations in line with the JCQ regulations. This is generally conducted towards the end of Year 9 and permission is sought from parents before any assessing is carried out. Please read our Special Educational Needs Policy.